A perfect companion DVD to Fear of Falling: A Matter of Balance, Exercise It’s Never Too Late challenges the common notion that inactivity should be accepted as a “normal” part of aging. 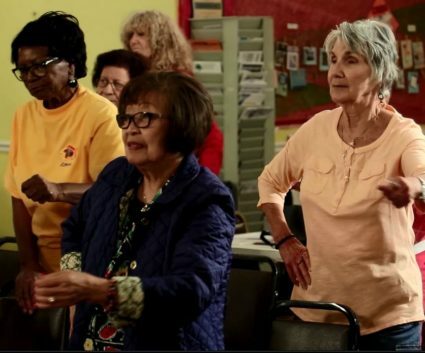 It acknowledges how easily inactivity can creep in as many older adults often stop activities they once enjoyed simply because of their age, or lack of energy, and encourages small, doable steps to get active again. The DVD looks at the different forms exercise can take for older adults, and how activities can be easily adapted to fit individual needs or capabilities. Several older adults also share their personal experiences with how staying active not only boosted their physical strength and social engagement, but gave them a more positive outloook on life itself.